Columbus Day is a celebration of brutal conquest and white supremacy — one that UC Santa Cruz is complicit in by ignoring calls to remove the mission bell in front of McHenry Library. The bell is a constant reminder of the genocide of indigenous people at the hands of Spanish conquistadors centuries ago. In the late 1700s, colonizers built missions along El Camino Real, enslaving and killing thousands of Amah Mutsun people — native to Santa Cruz, Santa Clara, San Benito and Monterey counties — among other tribes. Later, Mexicans and Americans continued the mass murder and Amah Mutsun people were forced to relinquish their culture or be killed. The tribe now has less than 600 registered members. UCSC’s administration perpetuated oppression by ignoring calls from students and tribal members to remove the bell after the tribe presented a resolution to the administration in May. The resolution also requests that UCSC place an educational marker in a prominent place on campus that recognizes the Native people on whose land the university is built. Considering the bloodied past of this land, replacing the bell is the least administration could do. It’s impossible for the university to move toward a just education if it’s still preserving symbols of genocide in the name of eurocentric history. Keeping the bell on campus glorifies the work of conquistadors, ignoring the massacre of indigenous people while current members of the Amah Mutsun tribe are still recovering from its effects to this day. Members have to work to relearn their tribe’s traditions lost after its genocide. Some are unsure of their ancestry, and others learn traditions from the internet instead of their grandparents. 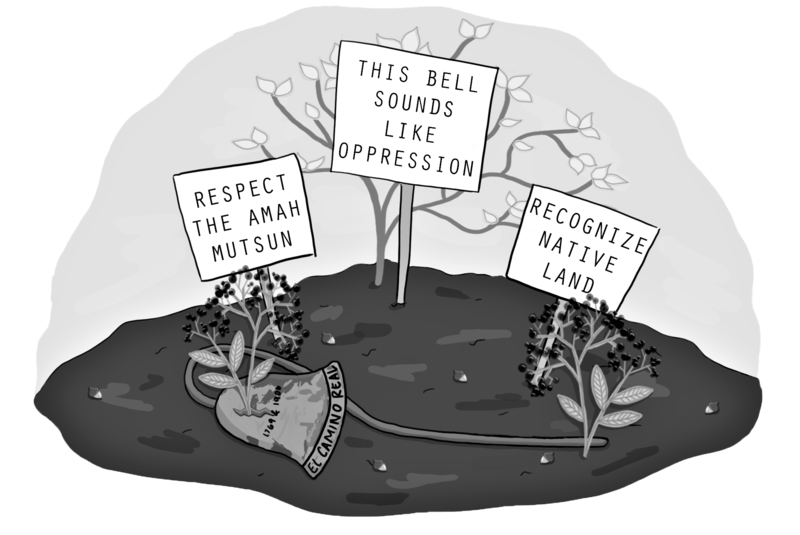 UCSC must remove the mission bell and finally acknowledge the painful history it symbolizes to the Amah Mutsun and other Native peoples in California. The administration’s demonstrated complacency adds to the erasure of indigenous identity. Counteracting this complacency will require more than the simple and overdue process of removing the bell. The university made a lukewarm effort to support the Amah Mutsun Tribe when, in 2009, the Arboretum worked with Amah Mutsun people to establish the Amah Mutsun Relearning Program. Through this program, the tribe’s members can relearn traditional ecological knowledge, practice plant identification and traditional ways of resource management and harvest these crops to use in their own homes. However, without federal recognition or political sovereignty, the tribe has no rights concerning traditional land, access to scholarships or other benefits that government-sanctioned tribes have, making the cultivation of a unified community difficult. Helping to re-implement Amah Mutsun traditions is important and should not only be continued but expanded. Aiding them in gaining federal recognition by providing support, financial and otherwise, should be a leading — if not foremost — goal of the university. Having access to their land would allow the Amah Mutsun to live and learn from one place they call home. UCSC is built on traditionally Amah Mutsun land, but provides a comparatively small parcel of land for the tribe members to use. If tribal members don’t have the time or financial capability to come to the Arboretum, UCSC’s relearning program is purposeless. If UCSC continues to use this land, Amah Mutsun people’s sovereignty must be at the forefront of the administration’s conscience. By effectively ignoring the mission bell as a symbol bloodied by genocide and not taking an active role in helping Amah Mutsun people to gain sovereignty, the university is telling them their history on this land doesn’t matter. Administration must listen to the demands of Amah Mutsun people and students must use their proximity and privilege to command this happens. Email the chancellor, post on social media and let this injustice be known.